I rarely get a chance to write when I am out on the road but I thought I would take a moment to check in since I have not posted here in a few weeks. I am at the 49th Annual Monterey Jazz Festival in Monterey, California. This is the granddaddy of jazz festivals and so far it has been great. On Friday evening and Saturday, I got to hear great music from The Yellowjackets, Roy Hargrove & RH Factor, Babatunde Lea, Peter Apfelbaum, Hiromi, Robert Glasper, Kurt Elling, Robert Lowery & Virgil Thrasher, McCollough Sons of Thunder, McCoy Tyner, Bobby Hutcherson, and Dianne Reeves. Today, I am looking forward to seeing Dave Brubeck, Oscar Peterson, Dr. Lonnie Smith, Hank Jones, and Aaron Goldberg. The Monterey Jazz Festival is like being at a banquet with more food than you could ever imagine eating. You know you can eat every dish or see every performer but it is great to get a small portion of as much as you can. Hmmmm…I must be getting if I am making food analogies. One of my coolest moments during the festival was meeting Dianne Reeves after her wonderful set in the Main Arena last night. She is very gracious. The photo above is from that special moment. More photos and notes very soon. In the meantime and as always, enjoy your music! This entry was posted on Sunday, September 17th, 2006 at 12:28 pm. It is filed under Monterey Jazz Festival, Music Reviews. You can follow any responses to this entry through the RSS 2.0 feed. Congratulations, I recall my first time meeting Dianne Reeves and having an opportunity to produce a record she performed in part. I was floored by her masterful talent. So, I am aware of your excitment! I would like to extend my warmest grattitude to you. Your photos tell a great story of the intensity and passion of some wonderful musicians I have the pleasure to create and express with. It is my sincere wish that the music touched your being and will inspire you to share all that made you feel good. I create my music for you! I am grateful to you for being at the Monterey Jazz festival to accept it. Thank you. ooo, can’t wait to hear about your time spent with dianne reeves! hope you had a great weekend, j! 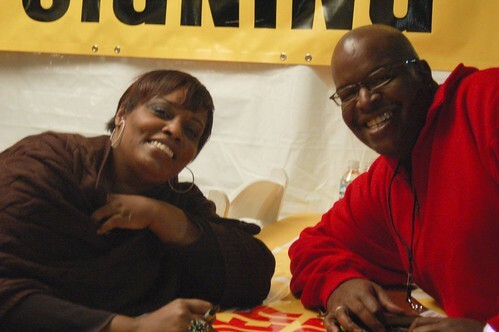 I love, love, love me some Dianne Reeves. As much as I LIKED “Good Night & Good Luck,” I absolutely adore the soundtrack because of sultry voice and impeccable talent. I listen to it often and would love to see her perform live.